Pair TS212S with any full-range speaker system to extend the bass response and dramatically enhance the overall impact of the music being played. 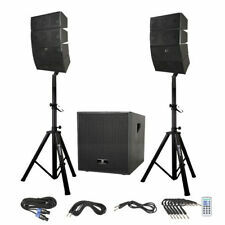 Alto Professional TS212S 1250 Watt 12" Powered Subwoofer Features. The sub has a center channel amplifier. The sub has been tested and everything on the sub works as it should. This sub is in Good working condition. The lights on the sub work as they should. There is nothing broken or missing on the sub. 1 x Subwoofer with PowerCord. Used- in very good condition. Has been tested/inspected and is fully functional. Working really good. Just Subwofer/PowerCord Only. Other accessories are not included. 35mm/ 1.38". -Built-in treble horn and bass horn. 210mm/ 8.2". Shell material: Wooden. -Unique paper cone design, so that the bass is more robust, more stable performance. -Box ultra-thin design, put in under the car seat. Instantly pair with iPhone,iPod, iPad, android devices, etc with line of sight of up to 66 feet. Use side handles to lift and transport the subwoofer conveniently. Rock-solid subwoofer is made of MDF material and reduces resonance for distortion-free and accurate response. JBL LSR310S 10". Active/Powered Recording Studio Subwoofer SUB. Audio Interfaces. Speakers & Monitors. With a Digital Signal Processor (DSP) built in, this subwoofer allows you to add extended boost or low-frequency response to enhance your system's performance and get the most out of this workhorse sub. In good condition. It works great. Also very little scratches and dings. Canton 6.2 subwoofer 8" Aluminum Wave Surround woofer. Active Powered. EXCELLENT CONDITION. GREAT DEEP BASS! ORIGINAL OWNER. BEHRINGER is proud to incorporate world-famous, custom-engineered TURBOSOUND speakers into select products for the ultimate in high-quality audio reproduction. High-Performance Active 3000-Watt PA Subwoofer with 18" TURBOSOUND Speaker and Built-In Stereo Crossover. WOOFER: 12" Subwoofer. WOOFER SPECS: Hi-Fi 12" Speaker - Yellow Paper Cone - 1.5" Voice Coil - 50 oz Magnet. CONTENTS:Powered 12" Studio Subwoofer. The Seismic Audio Spectra series of Studio Reference Subwoofers are ideal for any Professional Studio Mixing application. JBL EON618S 18" Self-Powered Subwoofer. The EON618S is a powered portable PA subwoofer in the EON600 series from JBL Professional. EON618S Features (1) JBL EON618S 18" Self-Powered Subwoofer. 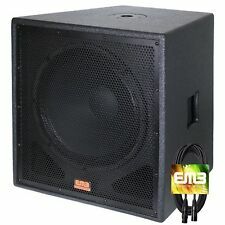 JBL Professional EON618S 18" Self-Powered Subwoofer Specifications. On top of that, the B1200D-PRO's compact design makes it ultra-lightweight and easy to transport. This revolutionary amplifier design eliminates the need for huge power supplies and massive heat sinks, ensuring that your speaker retains all of its power, despite its light, energy-efficient form factor. Max Power: 600W. 1 x Subwoofer Speaker. Low frequency ability of the bass horn, high quality low tone output. Alloy fuselage to reduce the noise caused by the vibration. Easy to install and use. We will do our best to reduce the risk of duties. Focal JMlab Active Subwoofer (BP 374). Condition is Used. The Rockville RVB12.1A is a 12" powered subwoofer that gives you everything you want out of a car subwoofer. This is a complete system with the subwoofer, enclosed in a box, along with a built in amplifier.